Up until recently there was no legal requirement for tenants to allow landlords to enter their homes to inspect and check the safety of the electrical components, making it difficult to keep tenants as safe as possible. However, now there is. Les and Jamie were asked to join the Electrical Safety Roundtable (ESR) alongside other Social Housing Providers, as members of the Association of Electric Safety Managers group. On Wednesday 23 January 2019, Les and Jamie were invited to the House of Commons in London to see the bill get passed. how to manage the data compiled during electrical inspections and tests. Ryan Dempsey, chair of the ESR’s Social Housing Sub-Group, said: "I spent many years working in social housing and found it very difficult to justify some of the decisions I was making to others because there was no standard to refer to. This Code of Practice will provide that justification. What makes this document particularly special is that it has been developed by experts in the management of domestic tenanted properties. Their first-hand experience has allowed us to directly address the most common concerns in the sector, which we have done in a way that will be easily understandable even for those without specialist electrical knowledge." 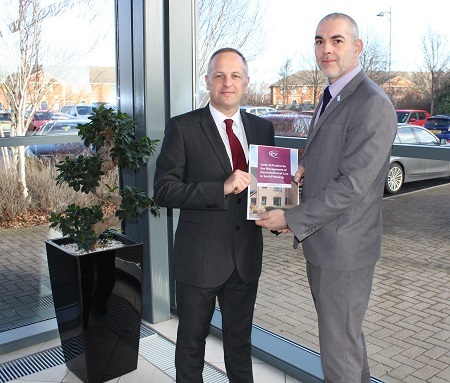 Mike Andrews, NAPIT’s Group Chief Executive, said: "This document is a real step forward for the social housing sector. Striving for higher standards has always been a key part of NAPIT’s ethos, and while safety has improved dramatically in the past few decades, there is always more that can be done. If the recommendations in this Code of Practice are widely adopted, we are sure that the safety of social housing tenants across the country will be significantly improved." You can read more about the Code of Practice here.